Libya sanctions shift possible when unity government controls fund: U.N.
UNITED NATIONS (Reuters) - The U.N. Security Council said on Thursday it was ready to consider changes to sanctions on Libya's sovereign wealth fund once a unity government confirms it has control of it, along with the National Oil Corporation and the central bank. The 15-member council imposed an asset freeze on the Libyan Investment Authority (LIA) in 2011 to prevent the government of former leader Muammar Gaddafi from spiriting away the wealth. A 2011 uprising toppled Gaddafi, but left the country in chaos. Libya's U.N. Ambassador Ibrahim Dabbashi has asked the council for a sanctions exemption on the investment authority, to halt billion-dollar losses caused by ineffective management. The LIA's total assets were valued at around $67 billion at end-December 2012. The U.N. Security Council unanimously renewed sanctions on Libya on Thursday and asked the new unity government, which emerged from a U.N.-mediated deal signed in December, to confirm "as soon as it exercises sole and effective oversight" over the LIA, National Oil Corporation and the Central Bank of Libya. 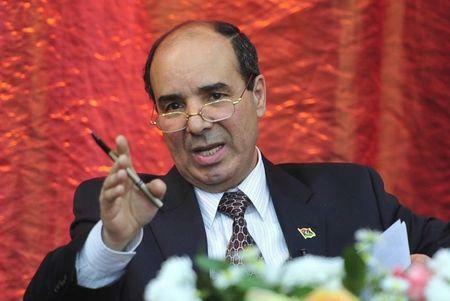 The council said it was important these institutions continued to function for the benefit of all Libyans. The U.N. resolution took note of Dabbashi's request and "affirms the Security Council's readiness to consider changes, when appropriate, the asset freeze at the request of the Government of National Accord." A power vacuum that was created by two competing governments backed by militias scrambling for control of the oil-producing country has allowed Islamic State militants to gain a foothold in the North African state. Members of Libya's Presidential Council reached Tripoli on Wednesday, defying attempts to keep them out and prevent them from installing the unity government. Western powers have recognized it as Libya's sole legitimate government, but it faces opposition in east and west Libya. The U.N. Security Council expressed its determination to support the unity government. Libya's political turmoil has also left the LIA mired in a power struggle between two rival chairmen, Hassan Bouhadi and AbdulMagid Breish. A court case between the pair in London's High Court was adjourned earlier this month with the judge declaring it would be premature to rule. Ambassador Dabbashi said Breish "doesn't have any official post with LIA." He said the U.N. only recognizes Bouhadi, who was appointed as head of the fund in October 2014 by the internationally recognized government.